"There is so many wonderful things about being a ninja. Including - wearing ninja customes, buying the Dojo igloo, having access to the secret Ninja Hideout, and much more. But my favorite part is having ninja powers, like disapearing and making vanishing clouds. It is different than anyother thing in Club Penguin! I hope the Sensei will teach us more ninja moves in the future." This was written by Cena12121. Way to go earning 10,000 coins! For next weeks reviewed by you, Club Penguin wants to know what is your favorite Card-Jitsu Power Card? 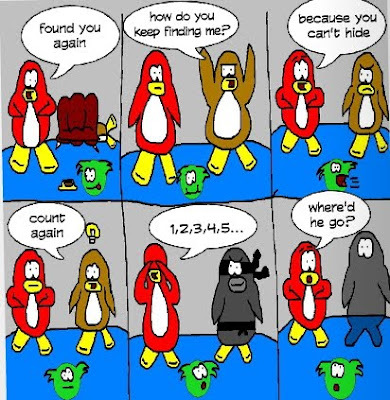 Also, congrats to Zxz192 for getting his comic in the Club Penguin Times. Saweet! Awesome cool, Z! You are really talented, dude!! Nice comic...! Totally EXCELLENT! Awesome! Someone I know actually got a comic in! Yeah being a ninja is really sweet. Heyy, that comic ISN'T new! wow thanks mimo for makin a post about it! lol i never thought u would do that but it was really nice of you! Thanks!!! CONGRATS Z you did AWESOME i like the comic! LOL! This is so awesome! I know Z and Cena!!! LOL! Hey, I know Cena12121! And being a ninja is cool. And congrats, Zxz192! But it's kind of lame they don't put the person's penguin name in the comic, huh? Or do they? I don't know. hehe.Cool... Also my member sign upgraded today!!!!! I was so excited and happy!!!!!!!!! Awesome Zxz! Way to go! I like all the reactions and drama to make it realistic! ps. funny comic! lol i liked the puffle! lol!! i like the surfing card its awesome and congrats to the comic guy! Congrats Z! Grat Job, Cean too! WOOTS FOR ZXZ! good comic! awesome! has anyone noticed that white stuff on top of the beacon? It wasn't there before was it. Heeeeeeeeeeeeeelllloooooo. woweee, the mod list has...errr... GROWN. Wow xD How's everyone? mimo, did u know u can find sensei. I did it was awesome! Congrats Zxz192 . Nice comic!!! I think I saw this before!It's one of my favorite comics. awesome! congrats Zxz!!! Great job, you did really well on the comic. Hey, mimo. I love your site! I will comment a lot, and I am trying to be a mod from now on! I have a feeling someones done somethin' like that before! It's kewl, still! BTW! (THIS IS 2 MIMO AND EVERYONE ELSE IF POSTED!) My party on CLUB PENGUIN will be TUESDAY SEPTEMBER 21,2009 Because...., My penguin will be....730 DAYS OLD! WHICH MEANS SHE'LL BE... 2 or 3 years old! (i joined September 2007)so yay! Glacier,Crystal and Northern lights so, SPREAD THE WORD IF YA CARE ABOUT 1 OF UR BIGGEST FANS! (u don't have 2 come tho) It will be @ 4:30-7:00. Congratulations!Your comic is really smart and clever!Nice Work! Hi i love ninjas i think we become samamaris next!